Fresh mint is right up there as one of my favorite scents in the whole world. It reminds me of my mum preparing a Sunday roast. Leg of lamb in the oven. And she stands in the kitchen chopping up the mint to prepare the mint sauce. She went mad at my dad one year when he dug up all the mint in our vegetable patch; he thought it was a weed.But mint brings so much to a dish. This is a great, quick, lunchtime recipe with so much flavor. 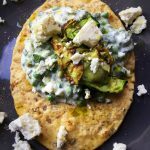 It’s easy to prepare, and there’s plenty of good healthy ingredients in the courgette, greek yogurt and feta. It’s filling and nutritious. I recommend using a flatbread with seeds and wholegrain. Courgette often loses it’s flavor because of it’s high water content. So in this recipe, I have suggested using a potato peeler to turn that courgette into beautiful bright-green courgette ribbons. Once griddled on a hot pan, those slightly blackened crispy edges will really make a difference to this dish. Cook the peas, and stir in the yogurt and some salt and pepper. Meanwhile, cook the courgette ribbons in a griddle pan in a very small amount of olive oil. They are then so it won’t take long, and you don’t want to overcook them – make sure they still have that beautiful green colour. Lightly heat the flatbread in a toaster or under the grill – just so it’s warmed through. 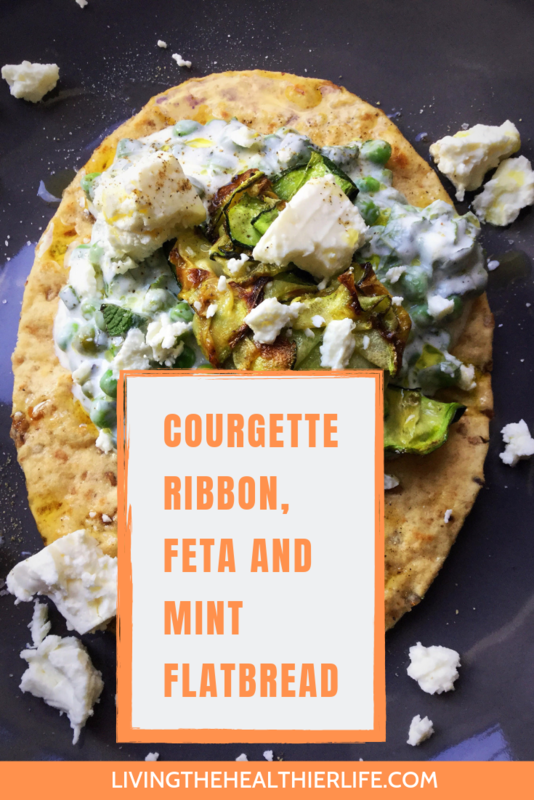 Place the pea and yogurt onto the flatbread, top with the courgette, crumble over the feta, and finish with a generous handful of chopped mint. Season to your liking, and finish with a drizzle of olive oil.